In the stillness of the night I slumber, peaceful resting after a tiring day. Then suddenly I awake from a sound sleep. It is three in the morning. I roll over and try to go back to sleep, yet it alludes me. As I lay there, wrestling with my mind, I begin to think about my novel, THE STONE OF EBENEZER. Over the past month, I have been jumping through hoops in an attempt to meet the many varying requirements preferred by literary agents in an attempt to interest just one of them in my story. It is a daunting venture. I am overwhelmed in my effort to take a manuscript of over 90,000-words and condense it down to just a few sentences. At present, I have just completed writing chapter summaries of my novel. Each chapter has been stripped to a mere three to four sentences, all of which is to reflect my voice. Just the bare-bones….but how can you really appreciate the beauty of something when the outer covering is stripped away? Well, I digress. This all leads to the point. As I lay in my bed in the middle of the night, I review the chapter summaries in my mind. My novel runs like water through my restless brain. It is then that I am struck. I have an epiphany as it were. I am blown away. I have always wondered why the story had to be written. 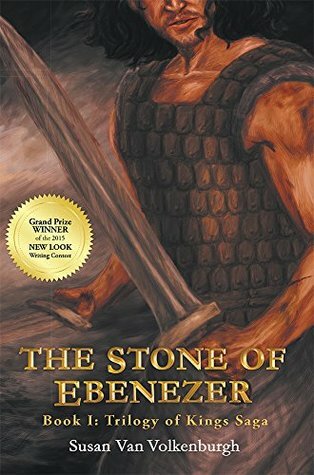 THE STONE OF EBENEZER was not what I had intended to write, yet the tale kept pressing me until I finally gave in and wrote it down. This story is my story. Without realizing it, I wrote a tale that is an allegory of the personal struggles I have faced. It is a story of loss and resolution, of moving beyond the tragedy and trauma of the past to find a peaceful place to rest. As the main character worked through his crisis of faith, I journeyed with him, cried with him, loved with him. I began writing THE STONE OF EBENEZER, after the loss of my father on September 11, 2001. Well, really, I was trying to write about King Saul, but the story took a different turn. King Saul will have to wait. The novel seemed to have a life of its own, its purpose not clear to me until I awoke at three in the morning. I do not know why I had not seen it before. Working beneath my mind, I unwittingly transcended beyond the distress in my own life. Through it all, I have reached resolution. I invite you to join me on this pilgrimage, and within the pages of this epic tale, may you find a place to rest. Let the journey begin….THE STONE OF EBENEZER. To learn more about my experience with September 11, 2001, read my book: SILENT RESOLVE AND THE GOD WHO LET ME DOWN (a 9/11 story). You can find it at Amazon, Barnes and Nobles, LifeWay or your area retailers.